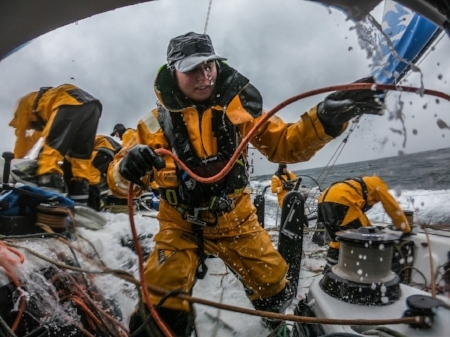 As we are about to set off on the final leg of The Volvo Ocean Race I realised that I hadn’t yet spoken about leg 10. The leg was probably one of our best so far and even though we didn’t make the podium that everyone so desperately wanted us to make we fought a hard battle, as we always do, and kept our heads high. Sailing around Ireland was stunning and there were gains to be made and also lost. It reminds me a lot of New Zealand but the best part of the leg was definitely blasting along the top of Scotland to Sweden where we match raced with Dongfeng. We had boats within our sights for the majority of the leg and learnt a lot by doing so. Not a lot of sleep was had but I fear we achieved more sleep on that leg than we will on the leg we are about to start but with just 72 hours or so left of racing offshore in this race we can sleep when we hit The Hague. Crossing the finish line in Gothenburg was a joyous one; we managed to position ourselves in the fleet with a boat between Scallywag and ourselves, which was our aim when we set out on the leg. Our time here in Sweden has been short but our in port race was our best to date. Again not a podium finish but in our eyes our performance on the water was what we needed going into this next leg. This final leg will be a tough one, as you may know there are three boats that could potentially win the race, but we have a combat of our own going on at the bottom on the points board as well so we are just as hungry for a good finish. This race has been the greatest and toughest adventure of my life both physically and mentally and I’m so grateful to have had an overwhelming amount of support through out it. Bring on the final leg as we take on what seems to be a tour of Europe before arriving in our final destination of The Hague where we can officially say we have sailed around the world and completed the Volvo Ocean Race.